There are many different types of shoulder pain such as impingement syndrome, shoulder dislocation/instability, frozen shoulder, rotator cuff tear, tendinitis, and AC separation. The shoulder girdle is a complex joint with extreme mobility which means there is less stability to the joint. This makes the shoulder joint prone to many injuries and chronic shoulder pain. In addition, the surrounding structures (muscles, ligaments, tendons, and capsules) of the shoulder joint require high demands on stabilizing function. 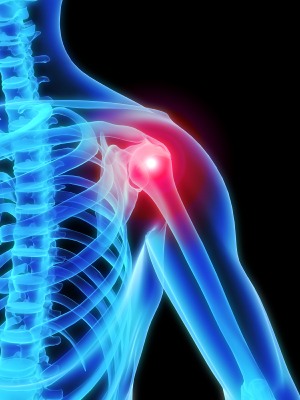 Shoulder complaints are common in sports injury, occupation requiring overhead work, and repetitive overuse injury. Shoulder pain is also a common site of referred pain especially from neck/thoracic joints, heart, and lungs. As a result, it is important to get examination done to figure out the cause of your shoulder pain. The shoulder girdle is composed of multiple joints and those joints are subject to biomechanical compromise. Thus, chiropractic adjustment and myofascial relief therapy (MRT) of the surrounding muscles will help tremendously with shoulder pain. Other additional treatment options such as bracing and stretching should be considered after examination and consultation with your chiropractor at Chiropractic Concept of Bellevue.